The first step in any trade facilitation project is to identify the scope of work. International trade involves commercial, logistic, regulatory and payment processes. Parties involved in these are Customers, Suppliers, Authorities and Intermediaries (such as Transport Service Providers and Financial Institutions who provide services to them). Any trade facilitation project will concentrate on parts of the supply chain and the International Supply Chain Reference Model (The Buy-Ship-Pay model) may be used to help identify the parties and processes involved. 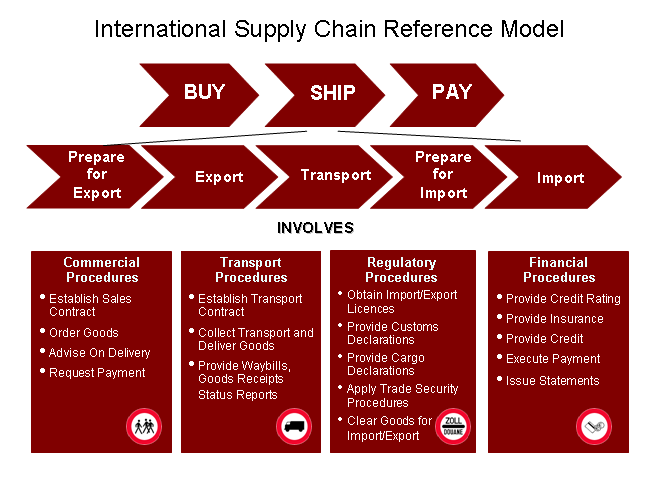 The figure below provides a pictorial representation of the commercial, logistic, regulatory and financial processes involved and its use is illustrated in the example. Be precise about the scope of the process analysis study. Do not set a scope that is too broad or vague. Set the scope from the perspective of the beneficiary, e.g. exporting a strategic product of that country by a major mode of transportation. But if, for example, one wants to study the business processes of several products being exported and imported by different modes of transportation, the process analysis study can be split into several small projects, one for exporting and another one for importing each different product through a certain transportation mode. The next stage of the Business Process Analysis process is to analyse and describe the "As-Is" Process. Refer to the Process Analysis Methodology to learn more about the deliverables and responsibilities of the roles in each phase.